The first computer circuit to be built on a single molecule has been unveiled by researchers in the US. It was assembled on a single carbon nanotube, a standard component of any nanotechnologist’s toolkit. 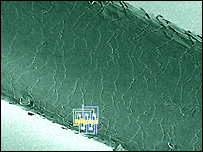 The circuit is less than a fifth of the width of a human hair and can only be seen through an electron microscope. The researchers, from IBM and two US universities in Florida and New York, told the journal Science that the work could lead to faster computer chips. Scientists have continually tried to push the boundaries of chip technology since 1965 when Intel co-founder Gordon Moore predicted that the number of transistors on a chip could double every couple of years. A transistor is a basic electronic switch. Every chip needs a certain number of them, and the more there are and the faster they can switch, the more calculations chips can do. For the last four decades, chip makers have managed to keep up with the proposition that came to be known as Moore’s Law. However, in recent years, there has been a realisation that silicon will be unable to maintain the same rate of performance improvement, prompting scientists to explore new nano-materials. The latest design consists of 12 transistors made of two different metals, palladium and aluminium. They are laid along the length of a carbon nanotube, essentially a rolled up sheet of carbon atoms, to create what is known as a ring oscillator. The finished circuit is just 18 micrometres (millionths of a metre) long and sits across the tube, which is substantially narrower. The circuit is not designed to be used in a computer chip. Instead, it is a proof of principle that allowed the research team to test the switching speed of its design. “The ring oscillator is a very nice tool,” said Professor Joerg Appenzeller, a researcher at IBM and one of the authors on the Science paper. “It allows you to characterise transistor properties as you would use a speedometer to measure the speed of a car,” he told the BBC news website. Using this setup, the researchers showed they could achieve a speed of 50 megahertz, hundreds of times slower than the gigahertz speeds of silicon processors seen in most personal computers. Even so, the researchers say the circuit is 100,000 times faster than any previously recorded for a device made with a carbon nanotube, and with continued refinement they hope to push speeds beyond those possible today. In the first instance, the researchers envisage that chip components like this would make it into computers as a hybrid device, combining the best of silicon with the best of the new carbon technology. The carbon would improve the speeds at which the chip can operate by being more heat effiicient than silicon, while manufacturers could continue to take advantage of the fabrication techniques they have invested so heavily in over the last 40 years. “We have a lot of experience with silicon and we know a lot about circuit design,” he said.